Fishermen line up to have their catches weighed during the 2015 commercial salmon season. This kind of work normally accounts for most of their annual earnings, but it may have come to an end. There was no buyer last year, so the men never launched their boats. Precious items of the Yupik people, long frozen in time, are emerging as temperatures rise. Now the rush is on to save them. The archaeological site of Nunalleq on the southwest coast of Alaska preserves a fateful moment, frozen in time. The muddy square of earth is full of everyday things that the indigenous Yupik people used to survive and to celebrate life here, all left just as they lay when a deadly attack came almost four centuries ago. Around the perimeter of what was once a large sod structure are traces of fire used to smoke out the residents—some 50 people, probably an alliance of extended families, who lived here when they weren’t out hunting, fishing, and gathering plants. No one, it seems, was spared. Archaeologists unearthed the remains of someone, likely a woman, who appears to have succumbed to smoke inhalation as she tried to dig an escape tunnel under a wall. Skeletons of women, children, and elders were found together, facedown in the mud, suggesting that they were captured and killed. As is often the case in archaeology, a tragedy of long ago is a boon to modern science. Archaeologists have recovered more than 2,500 intact artifacts at Nunalleq, from typical eating utensils to extraordinary things such as wooden ritual masks, ivory tattoo needles, and a belt of caribou teeth. Beyond the sheer quantity and variety, the objects are astonishingly well preserved, having been frozen in the ground since about 1660. Emma Frances Echuck and her daughter Valerie take a break from drying salmon in the village of Quinhagak. At a nearby archaeological site artifacts such as this mask are emerging from the permafrost as it thaws. The remains of baskets and mats still retain the intricate twists of their woven patterns. Break open a muddy, fibrous bundle and you’ll find crisp, green blades of grass preserved inside. “This grass was cut when Shakespeare walked the Earth,” marvels lead archaeologist Rick Knecht, a quiet, grizzled veteran of decades of digging. Knecht, who’s based at the University of Aberdeen in Scotland, sees a link between the destruction at the site and the old tales that modern Yupiks remember. Oral tradition preserves memories of a time historians call the Bow and Arrow Wars, when Yupik communities fought each other in bloody battles sometime before Russian explorers arrived in Alaska in the 1700s. Nunalleq offers the first archaeological evidence, and the first firm date, for this frightful period, which affected several generations of Yupiks. Knecht believes the attacks were the result of climate change—a 550-year chilling of the Earth now known as the Little Ice Age—that coincided with Nunalleq’s occupation. The coldest years in Alaska, in the 1600s, must have been a desperate time, with raids probably launched to steal food. Today increasingly violent weather has driven Nunalleq to the brink of oblivion. In summer everything looks fine as the land dons its perennial robe of white-flowering yarrow and sprigs of cotton grass that light up like candles when the morning sun hits the tundra. But the scene turns alarming come winter, when the Bering Sea hurls vicious storms at the coast. If the waves get big enough, they crash across a narrow gravel beach and rip away at the remains of the site. Steps away from the Bering Sea, archaeologists uncover the remains of a home that was abandoned after an attack in about 1660. Wooden walkways once connected the rooms in the large sod structure. Their upper surface was charred, and burned artifacts lay on top—evidence of the fires set by the assailants to smoke out the people inside. This centuries-old ulu, or cutting tool, was plucked from the thawing ground at Nunalleq. Embodying the native Yupik belief that everything is constantly in transition, the handle can be seen as either a seal or a whale. The Arctic wasn’t always like this, but global climate change is now hammering the Earth’s polar regions. The result is a disastrous loss of artifacts from little known prehistoric cultures—like the one at Nunalleq—all along Alaska’s shores and beyond. Ötzi, the Stone Age man whose body was found in 1991 as it emerged from a receding Italian glacier, is the most famous example of ancient remains brought to light by warmer weather. But a massive thaw is exposing traces of past peoples and civilizations across the northern regions of the globe—from Neolithic bows and arrows in Switzerland to hiking staffs from the Viking age in Norway and lavishly appointed tombs of Scythian nomads in Siberia. So many sites are in danger that archaeologists are beginning to specialize in the rescue of once frozen artifacts. They’re having to make hard choices, though. Which few things can they afford to rescue? And which will they just have to let go? 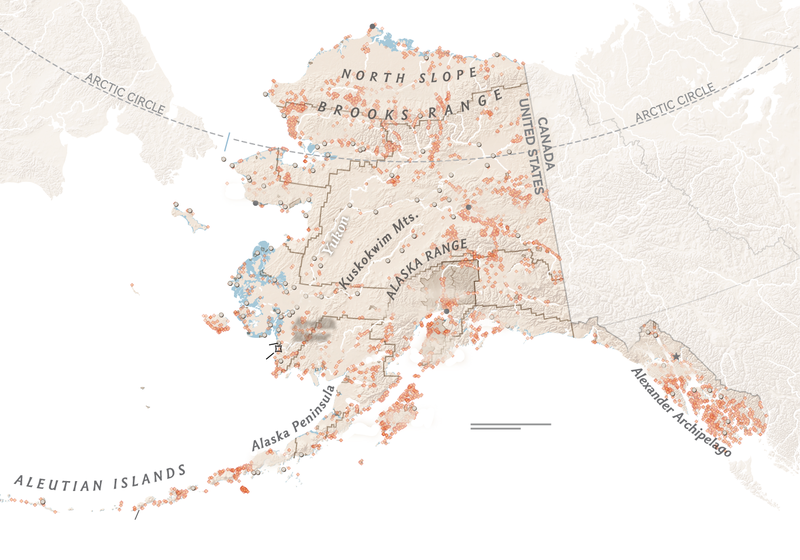 In coastal Alaska, archaeological sites are now threatened by a one-two punch. The first blow: average temperatures that have risen more than three degrees Fahrenheit in the past half century. 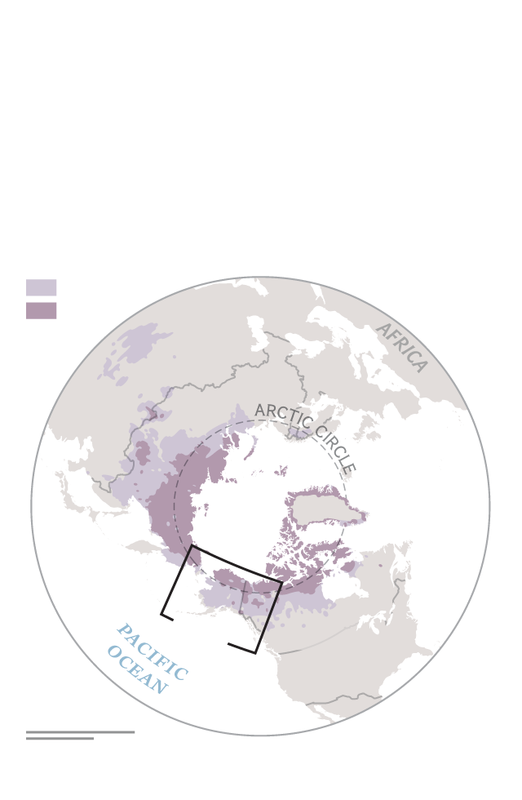 As one balmy day follows another, the permafrost is thawing almost everywhere. The effects of global climate change threaten hundreds of sites that hold clues to Alaska’s past. Permafrost once protected fragile artifacts from rot and mold, but warmer temperatures are now causing more and more of the icy ground to thaw in the southern part of the state. At the same time, seas are rising and winter storms are raging, putting sites all along the coast in danger. methane, compounding the effect. The warmed earth sinks as water drains away or is transpired by plants. Models based on current levels of greenhouse gas emissions project that by 2100 more than 50 percent of near-surface permafrost worldwide will be lost. Thawing releases buried carbon dioxide and methane, compounding the effect. The warmed earth sinks as water drains away or is transpired by plants. 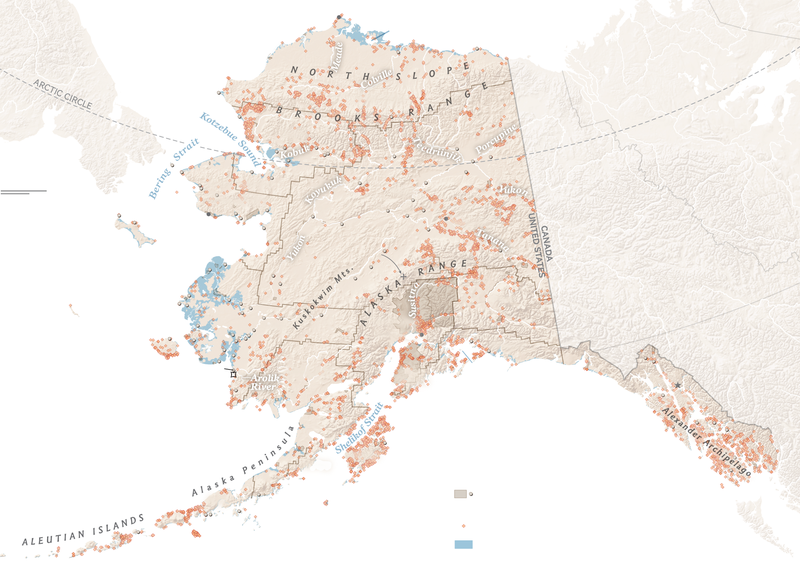 More than 80 percent of Alaska still has some permafrost. North of the Brooks Range the layer of frozen soil, rocks, and water extends to a depth of some 2,000 feet, but it becomes shallower to the south. coast as far as 100 feet inland. As sea levels rise over the next 50 years, parts of Alaska’s western coast will suffer storm surges that could regularly top 10 feet. 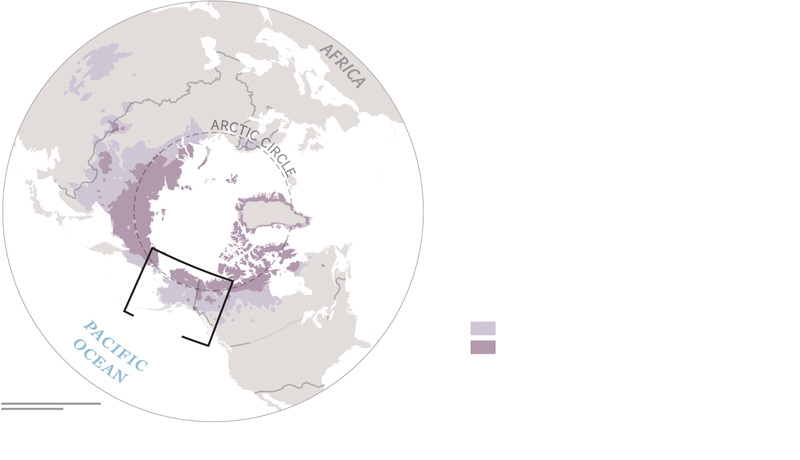 Low-lying areas where thawing permafrost is causing the land to sink will be especially vulnerable. anchored sea ice has melted away, a single violent event can erode the coast as far as 100 feet inland. Native-owned corporations oversee the property and resources assigned to each group in a region or village. When archaeologists began digging at Nunalleq in 2009, they hit frozen soil about 18 inches below the surface of the tundra. Today the ground is thawed three feet down. That means masterfully carved artifacts of caribou antler, driftwood, bone, and walrus ivory are emerging from the deep freeze that has preserved them in perfect condition. If they’re not rescued, they immediately begin to rot and crumble. The knockout blow: rising seas. The global level of oceans has risen about eight inches since 1900. That’s a direct threat to coastal sites such as Nunalleq, which is doubly vulnerable to wave damage now that the thawing permafrost is making the land sink. “One good winter storm and we could lose this whole site,” Knecht says. He speaks from experience. Since the start of the excavation, the relentless action of the sea has torn about 35 feet from the edge of the site. The winter after the 2010 dig was particularly brutal. Residents of Quinhagak, the modern village just four miles up the beach, remember huge chunks of ice slamming into the coast. By the time Knecht and his crew returned, the entire area they had excavated was gone. Since then Knecht has pressed on with a renewed sense of urgency. Rain or shine, during the six-week dig season, about two dozen archaeologists and student volunteers spend long summer days on their hands and knees gently stripping away soil with their trowels. On an August day that begins warm and buggy but soon turns overcast and cold, Tricia Gillam finds a common artifact that was created with exceptional artistry. It’s a women’s cutting tool popularly called an ulu—uluaq in Yupik—with a curved blade of slate and a carved wooden handle. The archaeologists often uncover a blade, a handle, or an occasional complete ulu, yet this one brings gasps from everyone. The handle has the graceful shape of a seal. 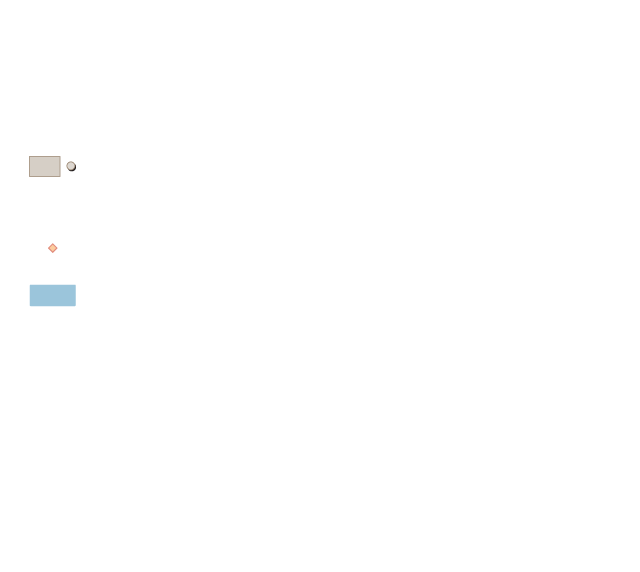 But that’s only half the design, it turns out. When local carver John Smith takes a look later from another angle, he sees the outline of a whale. The artifact speaks to the fundamental Yupik worldview that nothing is a single, inflexible entity because everything is in a state of transformation. The ulu handle is a seal, but it’s not a seal. It’s a whale, but it’s not a whale. Other finds embody that same idea: A mask that’s a walrus, or a person. A small wooden box that’s a kayak, or a seal. If anyone’s going to survive the changes occurring in the natural world, he believes, it’s these people who have always seen their environment as something fluid, requiring adjustments and adaptations. They know firsthand the seasonal patterns of plants and animals, and if there’s a shift, they’ll shift with it. On a visit to 86-year-old Carrie Pleasant (right), Sarah Brown gets advice on sewing a beaver-skin parka. Pleasant made fur garments for all 10 of her children, but kids today usually wear store-bought clothing. “Things are changing so much,” she said wistfully. Pleasant has since passed away. 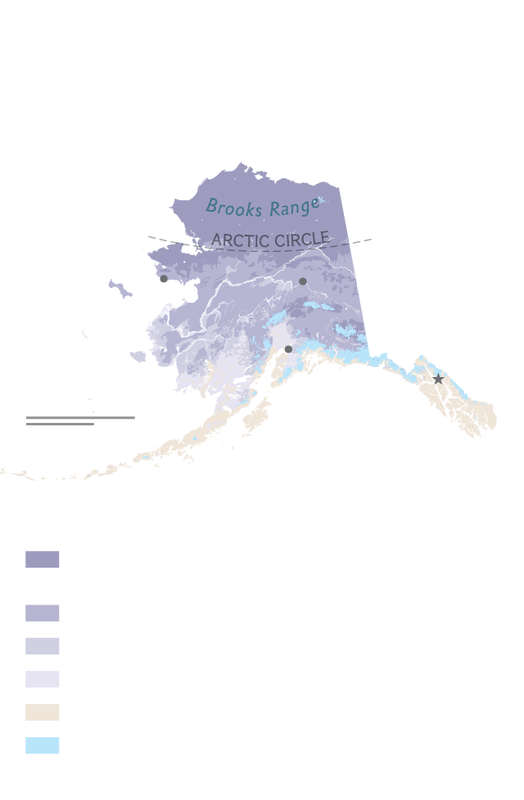 The village of Quinhagak sits on Yupik land at the mouth of the Kanektok River, which winds across the tundra in wide loops before spilling into the Bering Sea. A few gravel streets run past a school, church, post office, supermarket, hardware store, health clinic, gas station, washateria, cell phone tower, and three sleek wind turbines that spin in the brisk sea breeze. Officially, 745 people live here, in metal-roofed, wood-frame houses that perch on stilts a foot or so above the once frozen ground. But on any given day the actual population may be larger, swelled by relatives who have come to stay for several weeks, and residents of nearby villages who have come to shop, visit friends, and maybe pull in a few fish. Based in an office building that also serves as the archaeologists’ headquarters, 50-year-old Warren Jones is president of the local Yupik corporation known as Qanirtuuq, Inc., managing its 130,564 acres, overseeing its businesses and financial assets, and negotiating contracts with the outside world. But he’d really rather be hunting, he tells me. Along with almost everyone else here, he follows the same cycles of subsistence as the generations of Yupiks who came before him. From a traditional lookout, hunters scan the tundra for moose. Land and sea are like supermarkets for the Yupik, who know exactly what foods to search for in each season of the year. Locals’ ancestors carved the life-size mask above. Part human and part walrus, it was worn in a ritual dance to ensure a safe, successful hunt. “Even now, with rifles, going after a walrus is scary,” says Knecht. Early August, when the excavation is in full swing, is a busy season for the villagers as they tap nature’s larder. Berries are ripening across the tundra, and fat coho salmon, known here as silvers, are swimming up the Kanektok on their way to spawn. In keeping with Yupik tradition, Misty Matthew helps her mother, Grace Anaver, gather food for the winter. On the days she goes berry picking, Matthew drives an ATV deep into a flat, green landscape dotted with others on the same mission, hunched over as they fill their plastic buckets. Salmonberries ripen first, one small, sweet, orange cloud per plant. Then blueberries, with a vivid, sweet-tart flavor that no supermarket fruit can match, and low-growing black crowberries that are crunchy and subtly sweet. No one here thinks in pints. It’s gallons they need. Matthew stirs up some of her haul with sugar and fluffy shortening to make a snack called akutaq, or Eskimo ice cream. Then she makes jam in her grandmother’s old stainless steel pot, and jelly with the leftover juice. But the bulk of the picking goes into big chest freezers in a backyard shed. She opens all three to show me what her mother already has gathered. One is stuffed with berries in clear plastic bags. Another has berries, salmon, seal oil, trout, and smelt. The last holds moose, clams, geese, swans, caribou, and two kinds of wild greens. On another day, early in the morning, Matthew and her brother, David, take out their family’s motorboat to net salmon on the river. An hour later they bring 40 silvers, easily 20 pounds each, to the wooden drying racks along a quiet side creek where their mother is waiting. The two women spend the rest of the day gutting the fish, cutting fillets, and slicing strips for brining, drying, and smoking—everything done with deft strokes of their ulus. Like many people who grew up here, Matthew has sometimes left Quinhagak to find work, but the people, the tundra, and the river keep pulling her back. Yet even after years away, she can see that the natural rhythms of life are out of whack. Emma Fullmoon can count on younger relatives to provide food, like this salmon. And guests are always welcome in the home she shares with extended family. “That’s just what we’re supposed to do,” says her sister Fanny Simon. Though the Yupik idea of hospitality has endured, other customs have not. The wooden figure above has large, oval lip plugs, but no one today wears such ornaments. If there’s one thing everyone in Quinhagak agrees on, and talks about often, it’s all the changes brought by the weird weather. The strangest thing? Three successive winters without snow. On his computer, he pulls up a YouTube video made by a teacher at the village school. As the song “White Christmas” plays in the background, fourth graders try to ski, sled, and make snow angels on bare ground, in December. Even without warmer winters, the children’s lives are very different from what their elders experienced. Qanirtuuq chairperson Grace Hill, 66, sees trends that concern her—like the fading language. “When I went to first grade, I only spoke Yupik. Now the kids only speak English,” she tells me in the fluent, slightly accented English that she learned in school. And then, of course, there’s the modern technology that’s changing everything everywhere. “The kids are more into computers—and they’re forgetting about our culture,” she worries. Like other older villagers, Hill at first opposed the excavation of Nunalleq because Yupik tradition says ancestors shouldn’t be disturbed. But now she believes that archaeology can serve a greater good. “I’m hoping this will get the kids interested in their past,” she says. Alqaq, in a pink T-shirt, plaid capris, and movie-star sunglasses, is getting the message. On previous visits she has helped sort artifacts and sift the excavated soil for small things the archaeologists might have overlooked. She especially likes the dolls, she says, and the lip plugs. And what about the ulus, like the one her father made for her birthday, with her name carved into the handle? “It’s cool that we get to use what our ancestors were using,” she says without hesitation. Today’s visit is brief, with no work to do, so Alqaq and her father soon head up the beach toward home on an ATV. The weather-bleached whale bones piled around clothesline poles in a Quinhagak backyard likely washed up on a beach nearby. Village elders remember bringing home dozens of whales every year, but those days are gone. Hunters now may make just a single catch on the open sea. At the end of each field season the archaeologists have packed up what they’ve found and shipped it to the University of Aberdeen for conservation. But all the artifacts will be sent back later this year, destined for an old school building that Quinhagak has converted to a heritage center. Jones envisions this as a place where people can see, touch, and share stories about the beautifully worked possessions of their ancestors. Erika Larsen has photographed Sami herders in Scandinavia, tourists in Yellowstone, and writer Garrison Keillor in Minnesota.